The F5 Two-Head Fluorescent Lighting Kit from Interfit is a versatile photo or video lighting solution for portraits, products or e-commerce in the studio or on the road. 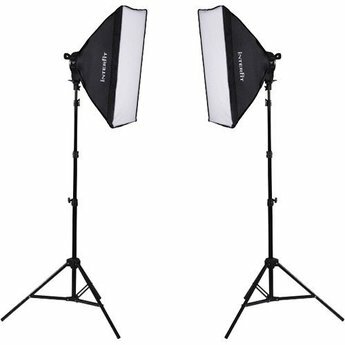 2x Softboxes: 19.7 x 27.5"
The F5 Two-Head Fluorescent Lighting Kit from Interfit is a versatile photo or video lighting solution for portraits, products or e-commerce in the studio or on the road. The kit includes 2 F5 five-lamp fixtures, each with a 19.7 x 27.5" softbox, 7.5' light stand and 5 daylight-balanced compact fluorescent lamps. The F5 head has a sturdy but lightweight polycarbonate construction with 5 Edison base sockets. Power can be regulated via 3 toggles on the unit's back panel that power on/off 2 lamps per switch and produce the tungsten equivalent of up to 800W. The lamp head has a tilting adapter with an industry-standard receiver for mounting on stands with a 5/8" (16mm) top stud. It's also conveniently designed to mount directly to the included 19.7 x 27.5" softboxes without using a speed ring. The kit is rounded out by 2 four-section 7.5' air-cushioned light stands that support up to 8 lb each and fold down to 27" for storage and transport.